What does the Petunia Skincare Hyaluronic Acid Serum do? The Petunia Skincare Hyaluronic acid serum gives your skin an intense hydration boost, plumping-up your skin and reducing fine lines and wrinkles to give you a younger, fresher, dewy complexion. All of the antioxidants in this serum help to reverse the signs of aging, caused by free radical damage, so any age spots, sun spots or differences in pigmentation are all minimized. 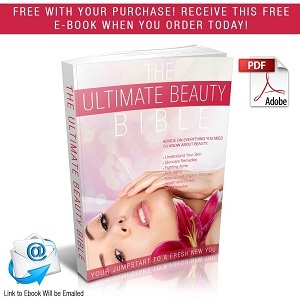 Your skin looks cleaner, healthier and more radiant. Plumps, firms and brightens your skin. Gives you a vibrant, glowing and even complexion. Chocked full of powerful antioxidants. No parabens, sulfates, gluten, alcohol or phthalates. Who should use the Petunia Skincare Professional Hyaluronic Acid Serum? This hyaluronic acid with vitamin C serum is of benefit to people who want to reverse the signs of aging. For example, those with reduced elasticity and collagen in their skin, dry or dull skin, dark circles under their eyes, spider veins, crow’s feet and fine lines. If you are wondering how to use hyaluronic acid serums, don’t worry because it is quite simple to include them in your daily beauty routine. All you need to do is cleanse your face and neck areas and apply your usual toner (if you use one) and then put a few drops of the serum on your fingertips and apply the serum to your face and neck while it is still damp. Follow up with a moisturizer and makeup if desired. Petunia Skincare Hyaluronic Acid can be used twice a day, morning and night. It absorbs quickly into the skin and is non-sticky. 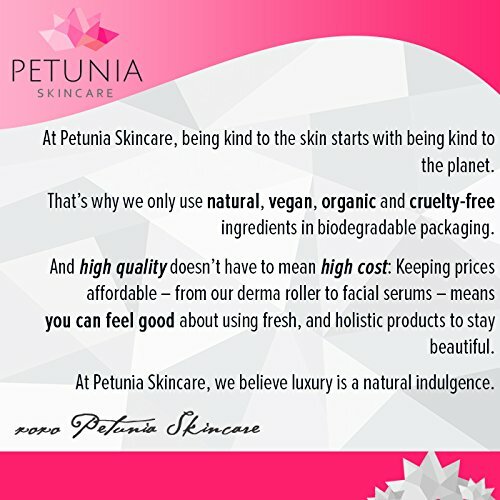 The Petunia Skincare serum is paraben and alcohol free, has no sulfates, phthalates or gluten, is suitable for vegans, is not tested on animals and is cruelty free. It is made in the USA in an FDA approved facility and is suitable for vegans and contains Hyaluronic acid, vitamin C and Ferulic Acid. Hyaluronic acid is a super hydrator and maximizes the moisture content of our skin. It is known as the fountain of youth, because it can absorb more than 1000 times its weight in water. A well moisturized skin looks younger and more radiant. A potent antioxidant, vitamin C helps to reverse the effects of free radical damage in our skin, such as fine lines and wrinkles. It is also essential in maintaining the integrity of our skin and is vital in cell production and wound healing. Ferulic acid is one of the most potent antioxidants (who knew?) and is made from rice bran oil and it actually can make the other antioxidants work better. A 2008 study found that Ferulic acid, in combination with vitamins C and E reduced free radical damage caused by sun exposure, reduced fine lines and increased firmness, texture and the smoothness of the facial skin after 24 weeks when used twice a day. 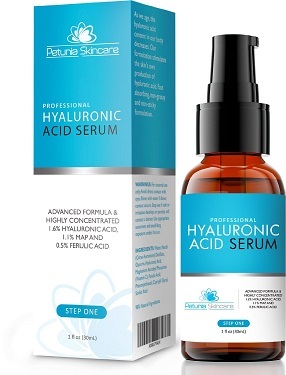 PROS: Nearly 95% of Petunia Skincare reviews gave this hyaluronic acid and vitamin C serum a 4 or 5 star rating which is an excellent percentage of customers who really like this serum. The main comments included the fact that this hyaluronic acid and vitamin C absorbs very quickly into your skin, reduces dark circles under the eyes, skin feels tighter and more hydrated and looks more youthful and glowing. One customer even used it to remove acne scars from her arms. There are a number of what appear to be paid reviewers or those that received a free sample and were asked to review this product. There are also what appear to be a fair number of genuine reviews of this product. CONS: Only a handful of customer reviews gave this serum a one star, mainly because they didn’t see any improvement in their skin. What can I say, I apply this on my face & neck day and night. Paired with Vitamin C first then hyaluronic my skin looks and feels hydrated. It really makes skin look more youthful and smooth. I’ve NEVER EVER had skin this smooth with any at-home product. I generally have to get routine facials to obtain this sort of smooth skin. I’m 21 years old and I have uneven skin tone complexion … after weeks of using it I’ve noticed my skin looks brighter and more nourished giving it a fair look. I love it! Does the Petunia Skincare Professional Hyaluronic Acid Serum work? Well, from the high percentage of 4 and 5 star reviews on Amazon this hyaluronic acid with vitamin C serum appears to be a premier facial serum and to actually deliver the goods. However, there are a fair number of customers who were asked to post a review for a free sample, so I wonder how much this has skewed the results. Nevertheless, there does seem to be enough ‘genuine’ reviews to have confidence that this serum is highly effective in reducing the fine lines and wrinkles that comes with aging and sun exposure, making your skin look years younger. If all of the reviews are genuine – then this is a top facial serum. Australian shipping: This product does not ship directly to Australia – check out my shipping guide for other easy shipping options to Australia (they work). 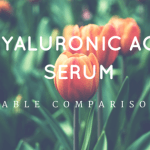 Check out my hyaluronic acid comparison table here.